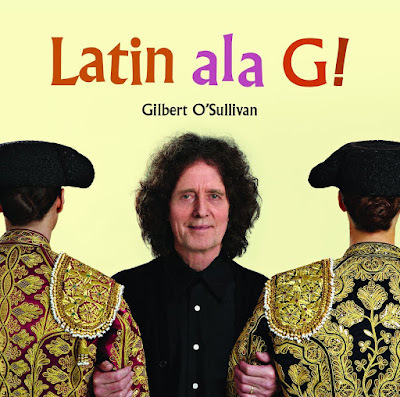 Discussions Magazine Music Blog: GILBERT O'SULLIVAN: Spaz reviews Latin Ala G! GILBERT O'SULLIVAN: Spaz reviews Latin Ala G! Best known here in the U.S. for “Alone Again (Naturally),” “Clair,” and “Get Down,” Gilbert O’Sullivan was hugely successful in the early ‘70s and could be heard blaring out of A.M radios from coast to coast. Gilbert possessed the confidence, charm and exuberance of Paul McCartney yet his lyrics were more observational than personal. For years, people assumed that “Alone Again (Naturally)” was autobiographical and felt sorrow for and pity for this man seemingly at the end of his rope. However, Gilbert was far from the depressed and disheartened man in that song – he didn’t write that song from experience at all. Like many great songwriters, he merely inserted himself into that situation and wrote from that point of view. Listening back to many of his albums, this approach to songwriting enhances the listening experience – there’s rarely a dull moment to be found on over 40 years of fine releaes. Though his fame in the U.S. was fleeting, he has continued to release albums filled with great songs although he is not as prolific as he once was. However, one Gilbert O’Sullivan album every five years or so is better than the great man retiring and never recording again so I’ll take what I can get! His records may not follow musical trends but Gilbert is one of the few veteran songwriters who still actively seeks out new music to listen to, which works in his favor. He certainly has his own unique style yet his desire to embrace new music encourages him to step out of his comfort zone on occasion. No matter what, he never loses sight of who he is as an artist and what people expect a Gilbert O’Sullivan album to sound like. Instead of going to either extreme, he reaches a compromise by moving forward while being himself. The changes can be subtle so his growth as an artist has evolved slowly over time. He’s never given less than 100% of himself and every one of his albums is worth your time, money and energy… unlike many of his ‘70s contemporaries. If Harry Nilsson can be embraced by a young generation then why not Gilbert? If you think about it, Gilbert is McCartney to Nilsson’s Lennon! Inspired by a few of Peggy Lee’s Latin-influenced albums from 1960, Gilbert’s 2015 album Latin ala G is a tribute to the rhythmic heart of Latin music that doesn’t forsake his skills as a master of melodies and a wizard of wordplay. In fact, it would seem that this Latin experiment adds more layers to the songs – they are sonically enhanced by new vibes yet, at their heart, they remain classic Gilbert O’Sullivan pop gems. “Made In Love,” the album’s first single, is a fine representation of the playful spirit of the album album while “I Guess I’ll Always Love You,” “Let’s See” and “Love I You” are lovely melodic nuggets that embrace the listener’s heart and soul. Gilbert has always known how to balance an album with songs that are heartfelt and songs that are clever… and Latin ala G is no exception. It is an album that is warm, inviting and shows that the man/myth/legend is just as relevant today as he was nearly 50 years ago when he first stepped into a recording studio. Don’t let the title of the album trick you – this is classic Gilbert with a Latin twist. I've always enjoyed whatever I heard from Gilbert O'Sullivan. He never needs backup singers in his songs, but if he chooses to have others singing with him, it almost always enhances the song. I would like to hear a Gilbert O'Sullivan revival in the USA; the USA hasn't been kind to him and his music. Sadly, I don't hear much of his music on any oldies stations in the USA. His latest release is refreshing, and true to his musical roots and nature.